Chimpanzees yawn contagiously with familiar chimpanzees and familiar and unfamiliar humans, but not with unfamiliar chimpanzees or species. In their latest study about empathy, Yerkes National Primate Research Center researchers Matthew Campbell, PhD, and Frans de Waal, PhD, have shown chimpanzees exhibit flexibility in their empathy, just as humans do. These findings, which appear in the current issue of the Proceedings of the Royal Society B, may help explain the evolution of how and when humans engage with others and choose to offer flexibility, and how we can do so more. While it's been long known that human empathy can extend to family, friends, strangers and even other species, it has been unknown until now whether nonhumans are similarly broad in their empathic responses. To answer this question, Campbell and de Waal used contagious yawning as a measure of involuntary empathy. According to Campbell, "Copying the facial expressions of others helps us to adopt and understand their current state." 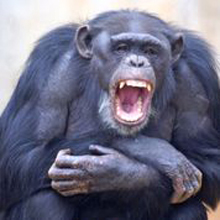 The researchers found chimpanzees showed contagious yawning to familiar chimpanzees, familiar humans, and unfamiliar humans, but not to unfamiliar chimpanzees or an unfamiliar species (gelada baboons). "That humans known and unknown elicited empathy similarly to group members, and more than unknown chimpanzees, shows flexibility in engagement," says Campbell. "We can use this information to try to influence this flexible response in order to increase empathy toward unfamiliar chimpanzees, and we hope we will be able to apply such knowledge to humans as well," Campbell continues. This study is a follow up to a study published in 2009 that showed contagious yawning in chimpanzees is not just a marker of sleepiness or boredom, but that it is a sign of a social connection between individuals. Campbell and de Waal have continued their work to better understand empathy as a window into social and emotional connections between individuals in order to help break down barriers among humans. This study was funded by the FIRST program, NIH/NIGMS (USA) IRACDA grant no. K12 GM000680, the National Center for Research Resources P51RR000165 and is currently supported by the Office of Research Infrastructure Programs/OD P51OD011132, and the Living Links Center at Yerkes. Within the fields of microbiology and immunology, neurologic diseases, neuropharmacology, behavioral, cognitive and developmental neuroscience, and psychiatric disorders, the center's research programs are seeking ways to: develop vaccines for infectious and noninfectious diseases; understand the basic neurobiology and genetics of social behavior and develop new treatment strategies for improving social functioning in autism and schizophrenia; interpret brain activity through imaging; increase understanding of progressive illnesses such as Alzheimer’s and Parkinson’s diseases; unlock the secrets of memory; treat drug addiction; determine how the interaction between genetics and society shape who we are; and advance knowledge about the evolutionary links between biology and behavior.